I have entered a short position in Australian Dollar futures. I have been thinking about doing this for a couple of weeks now, and today I became convinced that it is a trade I should make. Short entry occurred at 13:10 at a price of 1.0250. I have been watching the commitment of traders and have become increasingly bearish in this market. If you pull up a weekly chart for this currency and apply a 52 week exponential moving average, then you will see that prices are stalling just above the moving average. Now take a look at this daily chart for the September Australian Dollar futures contract. You can see three increasing price peaks, each about two weeks apart starting one month ago. Look at the MACD histogram and you can seethree corresponding price peaks, only in the MACD histogram they are decreasing. 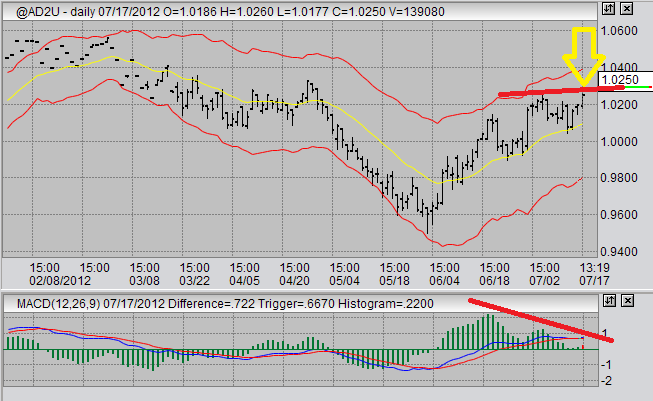 This is about as clear an MACD divergence as you can get. Does this mean shorting Australian Dollar futures today is a sure win? Of course not, but it sure does stack the odds in my favour. Remember, always use protective stops. Let us now observe the 60 minute price chart for this currency futures product. 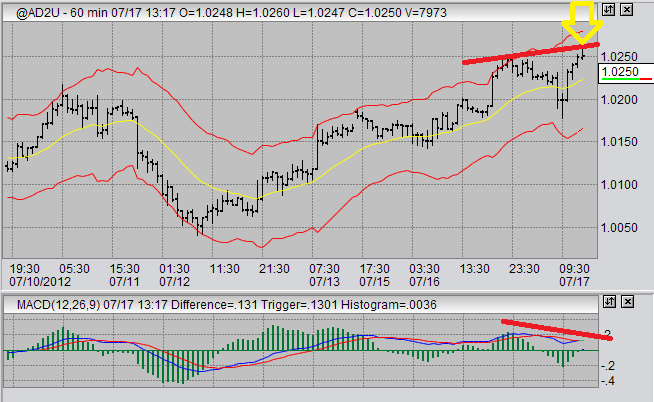 We can see in this futures trading chart that another MACD divergence is occurring simultaneously to the daily MACD divergence. I love it when that happens. This 60 minute signal alone would have prompted a trade, if I wasn't heavily biased towards waiting for the longer time frame to set up in this market. According to my daily chart analysis, I am targeting a minimum price move to the 1.0150 area. However, my weekly chart analysis is telling to aim (hope) for a price movement all the way down to the 0.95-0.96 area or even lower. We'll have to see how this plays out, assuming I don't get stopped out at a loss, I am going to be trailing my stop fairly loosely here trying to cash in on a bigger move to the mid 0.90's. In other markets, my 10 year T-note trade from Sunday evening ran against me on Monday. However, it did not reach my stop so I am still in that position. My short entry was at 134-190. Today that trade closed on a few points profit, but I am waiting for a significantly larger decline in this market. I am no longer enthusiastically bullish on sugar. In fact, I'm starting to get bearish. I'm not looking for a trade yet, but I will be in the next two to six week time frame, maybe. We'll see. Remember to always use stop loss orders on your trades. That way, when you make mistakes you will "live to trade another day".